The series should be read in conjunction with two excellent pieces by John Saunders on the magazine Chess in the war years, which may be accessed here and here - they were part of his series for the magazine's 75th anniversary back in 2011 (they touch on Bletchley Park, by the way). There is also a paragraph in John Poole and Stewart Reuben's hundred year history (up to 2003) of the ECF here, to which we will return later in this series. Correspondence chess in the period is covered thoroughly in chapter 12 of Tim Harding's History of Correspondence Chess (2011) - it flourished during the war, for obvious reasons. See also Bill Wall's notes here, for a wider remit, and his roll-call of chess players lost as a result of the war, and Nazi persecution. These posts, then, will confine themselves (apart from one or two asides) to two themes: first, the fate of local chess, and secondly chess in the armed forces at home. As we shall see, they were often intertwined. The last post in the series will add the County Counting theme as it touches on some County matches played near the end of the war. This small ration of posts will mean that much will be left out of the account. They will also have a slight bias towards events in London and Surrey, for which apologies to readers elsewhere. The British Chess Magazine (BCM) and Chess (Ch) are is the twin sources of most of the information (and quotes, with bracketed dates), but this will not be an analysis of the quality of their reportage of chess in the war - though the latter was, it has to be said, a good deal more outspoken about the role of the British Chess Federation. 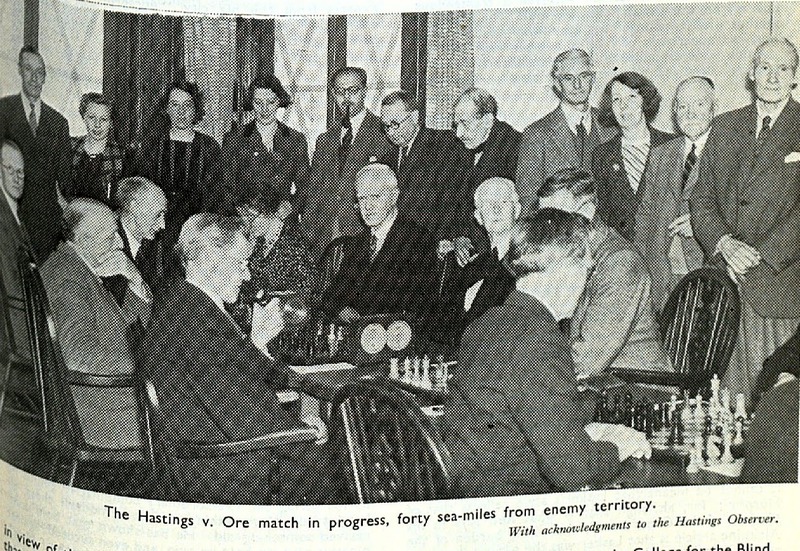 In 1941 (the third year of the war) T.C.M Olsen, a co-editor of Chess, wrote several articles detailing the state of chess activity on the ground, and these are invaluable in providing some detail. For me, a convenient way (if at the risk of oversimpification) of dealing with this mini history of WW2 chess is to have in mind these phases: (i) the "Phoney War" period up to the start of the blitz in September 1940, which was a period of retrenchment of normal chess activity; (ii) the "real" war period of the blitz through to May 1941, and then on through to 1943 when, along with rest of the country's activities, chess took a hit, but continued to raise its head over the parapet after the blitz ended; (iii) then from 1943 onwards chess activity picked up as the tide of the war turned against the Nazis with their defeat at Stalingrad in February of that year. the Nazis attacked the Soviet Union in June 1941. The Red Army was able eventually to repel the invasion and, with the other Allies, defeat the European Axis. War was declared by Britain on 3 September 1939, to be followed by what was known as the "Phoney War" - when, apart from the Dunkirk evacuation, nothing much seemed to be happening as Britain got on to a war footing. 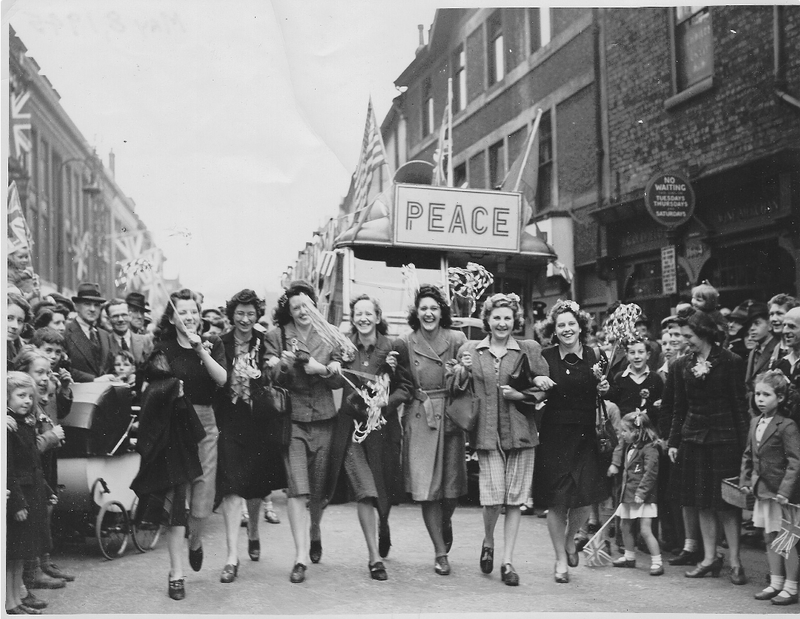 All that changed on the Home Front when the Blitz started a year later in September 1940. Bombs rained ferociously on London, the principal target, and many other cities for eight months into 1941 - and sparodically thereafter, until the Doodlebugs and V2 rockets fell in 1944. But even before the bombing, the blackout and transport restrictions had hampered normal chess activity. Of course, the war was anything but phoney where Germany had already invaded. But even France had its drôle de guerre until it, too, was invaded in June 1940, and endured the "années noires" of occupation - of which, curiously, British chess was a small beneficiary - until its liberation in the summer of 1944. So it was war. An international tournament had been held in Bournemouth in August (though the British Championship wasn't contested, the big hitters were in Buenos Aires - the 13 year old Elaine Saunders, "a girl", won the Ladies). The Bath tournament scheduled for 9-16 September 1939 was cancelled (BCM Oct), Hastings 39/40 went ahead; but the usual provincial Congresses pretty much stopped for the duration - though Golombek won a London Easter Tournament in 1940, and there was a "short tournament" with seven contestants in Cambridge April 41 (BCM May 41), and other small local tournaments, eg at Sidcup later on in 1942. "The London League naturally found it impossible to carry out this year its usual vast programme of matches" (BCM Feb 1940), though nonetheless a short inter-club tournament was arranged with six "A" division clubs entered (Battersea, Bohemians - the hosts, at Moorgate - Hampstead, Metropolitan, West London and one other) - it played over 10 boards for the prize of a chess clock. In the first match Battersea (with our old friend George Wernick on top board) beat the Bohemians 6 v 3. The "Clock Tournament" was won by Met with a 100% score. There had been an invitation tournament in December 1939 at the new National Chess Centre won by Konig. The NCC was billed to open in September, but it was to be in November - Chess in January 1940 reported it happening "quietly and without formal speeches, players simply sitting down and getting on with their games." There were more photographers at the London Boys Championship in the New Year, apparently; and some present also when, as ill-luck would have it, the NCC was destroyed by bombing on 18 September 1940. Irreplaceable historical chess artefacts and records were lost, together with equipment such as 100 sets and 1300 boards (figures given by Owen Dixson of Kent CCA, and the Southern Counties Chess Union, which lost its archive, in Chess Oct 43). In January 1941 the BCM reported that its Games Editor Rupert Cross "had a narrow escape in early December . Three High Explosive bombs dropped in close proximity to his home, somewhere in Essex, but luckily did only material damage mainly to the roof of his house." Adding, stiff-upper-lip-ishly, and up-yours-ishly: "The Luftwaffe is losing its grip." In February 41 readers were told that the chambers of Mr. Herbert Jacobs in the Temple had been damaged. Mr Jacobs had been an early Surrey CCA champion back in the 1880s , and a member of Brixton CC (see Brixton Byways 4). He had been a force in British amateur chess, also making a name for himself in the legal profession, famously representing Isidor Gunsberg in a spot of bother. "Luckily the damage was superficial" said the BCM reassuringly, "although annoying enough for a member of a profession where documents are all-important. We are glad to say that Mr Jacobs is in good health and his usual bright and witty self." There was worse to come. As the war got underway some clubs shut up shop, or just went below the radar as league chess was suspended (Brixton and Streatham, to name but two). But despite the difficulties, some continued (BCM Nov 39). In London: Hampstead played on with a summer handicap tournament in 1940. West London and Battersea likewise, as did Metropolitan although at one stage it had to vacate its premises "due to unforeseen cirumstances" (BCM Aug 1940). Kingston and Thames Valley CC continued with about a dozen members at regular Wednesday and Saturday evening sessions - "its membership reduced by such necessities as Air Raid Precaution work and the black out". Chess in November also mentions Ealing and Imperial CCs as still open. By December 1941 Morden CC (previously St. Helier CC, in Surrey) had joined the BCM's list of the "most active clubs" in London - it had played an eight board match against Hampstead (reported BCM July 41) losing 3 v 5. A "new and important" London Dutch team (though maybe not a club) played a match against the National Liberal Club in November - the NLC seemed to remain as a viable centre of chess activity. Amazingly, back in March 1940, a new club had started: in Sidcup in the south east of London, in the path of the incoming Luftwaffe, which would dump surplus bombs on the suburb as they returned home. 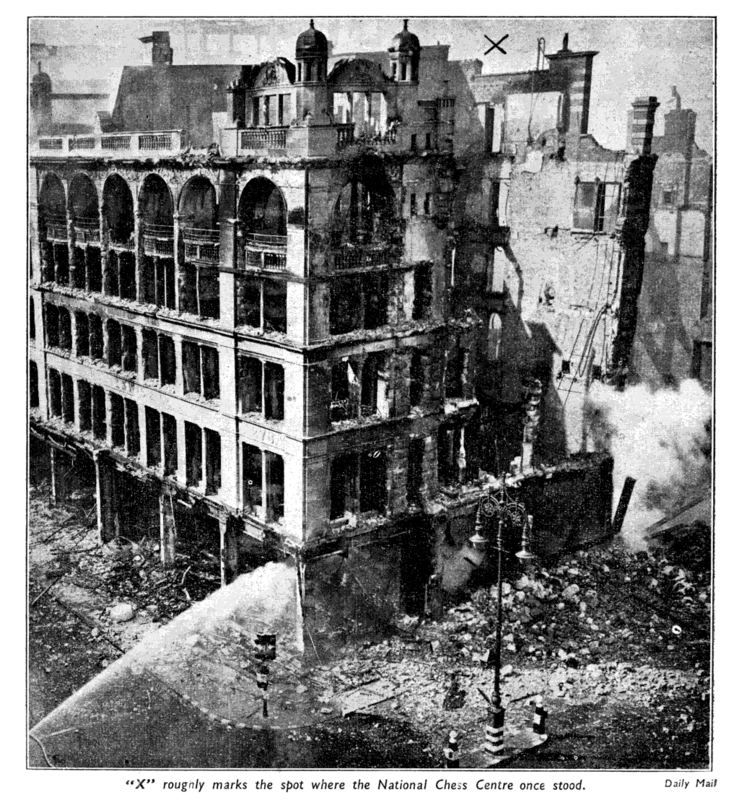 No surprise that it was "badly affected by the September blitz"; but once back on its feet it met on Sunday mornings and in light summer Friday evenings, playing teams from the local Civil Defence Service, the Air Raid Precaution, and the Bus Garage. In November 1940 the BCM reported that the Club hoped that Mr du Mont would come down to do a simul (the BCM would have known; du Mont was about to become Editor). Sidcup runneth over with chess. Outside London, chess activity hung on, or even bounced back, in spite of the disruption. After announcing its suspension of "all acitivities...such as inter-club and county matches" (Dover Express, 22 September 1939) Kent County Chess Association resumed its activities, as reported the BCM in May 1940, and it was to remain active - later holding a War-Time Knock-out championship in 1942 ("It is good to see a county so close to the 'Blitz Front' refusing to be intimidated into closing down" said the BCM). Owen Dixson was associated with this activity (which stands in contrast to that of Surrey CCA, to name but one) and he will reappear in later episodes. In the West Country "Cheltenham continues to defy the black out". The club in Bristol (a bombing target as a port city, and site of aircraft production) sensibly evacuated half of its equipment "to a country retreat, the club having had some near squeaks" (BCM reports in '40, and in '41 of a 10 board match v Bath). Torquay CC was meeting three times a week (BCM May 41). In the Midlands, Oxford CC (BCM Nov '40) benefitted from an influx of evacuees including Count Koralyi "the famous liberal [well, maybe a bit to the left of that - MS] Hungarian Premier" (who, in his autobiography, mentions "hurrying" to join Winchester CC on arrival, and earlier in Paris having watched Alekhine in the Cafe Régence play the proprietor and storm out as he was losing) and a Mr Young from the Channel Islands. "A wartime chess league has been formed in Leicester with the help of an army team, a team representing Czecho-Slovakia [ invaded by Nazi Germany - MS] and four local teams". Birmingham CC closed at 8pm, but in the "worst of the 'black-out' months a few members foregathered a the residence of Mr. A. T. Matchett in Edgbaston, but this was put an end to by the severe bombing of Birmingham in November and December last." (BCM May 41). Further north still, Bradford CC "in spite of its venerable age - or perhaps because of it - is still going strong", and knock-out competitions were running with Leeds and Huddersfield CCs. Chess in Scotland, by the way, was also going strong the while, although their Championship went into abeyance for the war. A useful summary and amplification of all this comes from "British Chess in Wartime" by Chess co-editor T.C.M.Olsen (Ch Nov 41 pp18-20), who was incidentally later to write a novel a "Taste of Death" (..."hair raising adventure...love interest...pace never flags" - Chess in Nov 43). 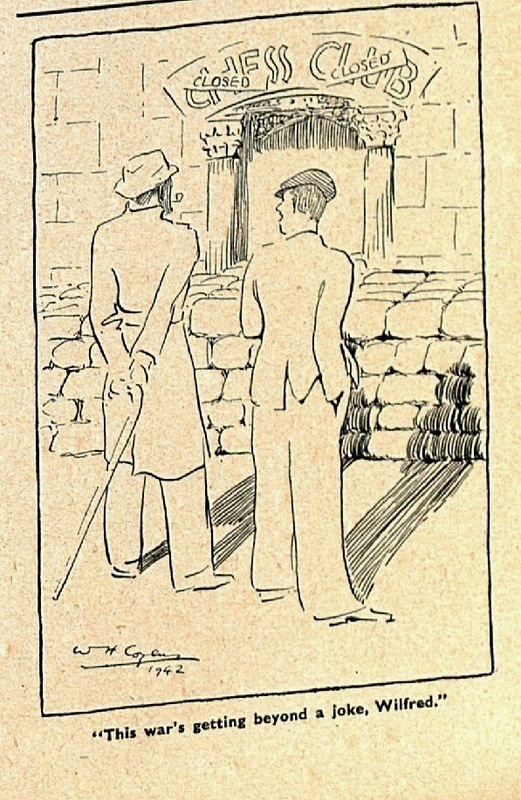 Not only was the London League "dead" but so were those of Birmingham and Manchester, but "away from the worst-congested areas the picture brightens", and, in addition, he references chess in Leicestershire, Nottinghamshire, Warwickshire, Hastings, Bognor, Horsham, Worthing, Swansea, Paignton, Exeter, Penzance...His picture of the chess is quite upbeat, and includes this nose-thumbing image of a match oblivious to the proximity of the enemy guns across the Channel. One can't help but notice the near absence of the younger generation. Let's note that in January 1941 the BCM reported on the "Nazi Chess Federation Tournament" at Cracow in 1940 without any noticeable partisan comment, and gave three games (there was lively comment in Chess February 1943 about reporting "Nazi chess"). Then in July 41 the BCM reported that Dr.Ossip Bernstein "one of the great figures in chess, who was a resident in France for the last twenty years, has been interned in unoccupied France, apparently solely for 'racial reasons.'" 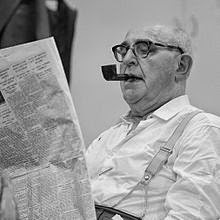 But, Bernstein was still very much alive in 1961. Other accounts of Bernstein's fate here and here tell how he survived, played on after the war, dying in 1962. But there was real tragedy: "Worse still Dr Cukierman, one of the leading chess players in France, has committed suicide, most likely to escape the same fate." He was Paris champion in 1930 ahead of Tartakover, of whom more later. According to this excellent French chess history site the championship of Paris was suspended in 1939 and 1940, and then contested during the German occupation from 1941 onwards. For more tragic losses among chess players of many countries see Bill Wall's above-mentioned roll of honour here. 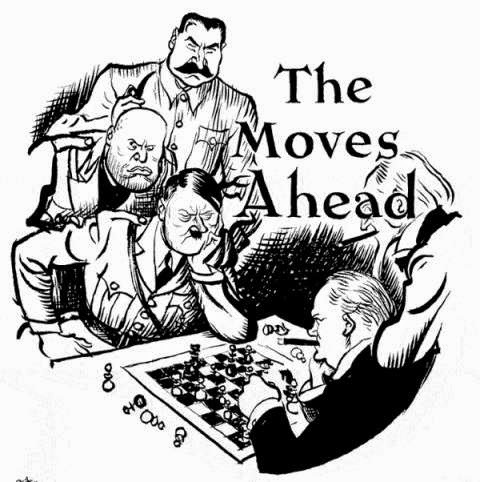 By January 1942 the BCM was moved to outrage at how the Nazis were corrupting chess culture. "The 'New Order' in Germany is busy on chess literature. The outstanding text book in the German language is Dufresne's Lehrbuch des Schachspiels...a new edition was entrusted to a 100% Aryan master. It will hardly be credited that the names of non-Aryan players have been omitted from the historical section, including Kolisch, Zukertort, Steinitz, Lasker, Rubinstein. Not only that, all their most brilliant games which adorned earlier editions have been eradicated, although a few of their games were allowed to remain - those they lost!" "War wrecks established club programmes but it breaks up cliques, throws deadly-keen players among ignorant but willing-to-learn non-players, scatters experts from the big city "nurseries" throughout countrified districts, brings in hosts of gifted refugees from other countries, makes people stay at home in the black-out and turn to quiet consolations...We need not worry for chess." Chess, like the country, may have taken a hit - but it was by no means flat on its back. Moreover, as the BCM had reported in May 1940, "chess appears to be very popular among His Majesty's Forces, the press continually publishes photographs of soldiers playing chess on the Western Front". We will follow this up in a week's time. Thanks to Chess, who readily agreed to the reproduction of material from their magazine. The BCM didn't get back to me but, given other generous agreements by them, I'm sure they will be happy. Thanks also, for their help, to John Rycroft and John Saunders, and of course Martin Cath of SCCA. On the National Chess Centre mention must be made of Martin Leanse's excellent articles, in Chess September 1994 and January 1995, based on documentation at the John Lewis archive, which has the correspondence between the relevant parties leading up to the establishment of the NCC, and much more material besides, including the disposal of its financial assets towards the end of the war. I was hoping they might have an inventory of material held by the NCC and/or lost in the bombing; but it seems not. This quote comes from the R.H.S. Stevenson near the time: the losses included "the best part of the BCF Library, all that came from the old City of London Chess Club, the entire effects of the SCCU, some Kent trophies and all the valuable four-handed chess equipment." My thanks go to the archive staff for their help and interest. Károlyi, Mihály. Memoirs of Michael Karolyi. Faith Without Reason (trans) (1956).